Just 17 km northwest of Larissa lays Tyrnavos, the second most populated town of the district. It is built along the left bank of River Titarisios (Xirias) and connects Larissa’s plains with Elassona. Boasting a deeply rooted tradition and history, the town reached its peak in the 18th century thanks to a booming manufacture of red dye for textiles as well as silk manufacturing and “alatzades” (textiles used for making naval outfits). Tyrnavos is today a dynamic, agricultural town, known throughout the country for its top quality wines and its very tasty “tsipouro” (alcoholic drink). In early autumn, grape harvesting begins with all residents participating in the traditional process. During the subsequent fermentation period, an intoxicating, perfumed “cloud” hovers above the town as the must is fermented and matured in the tanks. Everyone patiently awaits the distillation process to be completed. Locals and visitors alike blend in its particular ritual which also involves the offering of lots of “meze” (variety of delicacies) and naturally, drinking! 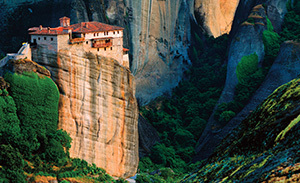 One of Christianity’s holiest places as well as a landscape of outstanding natural beauty. 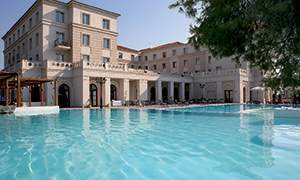 Larissa Imperial luxury hotel is ideal for business and leisure.